I decided to start filling you in on things that really bother me in the gym and occasionally elsewhere. I am a very laid back person but for some reason things seem to strike me wrong while I am working out. Most of these pet peeves are based on common myths that people uphold with their workouts resulting from lack of knowledge so I intend for it to be educational as opposed to me just blowing off steam. With that said, the first pet peeve I will address is walking on the treadmill or elliptical. I’m not talking about walking for recovery from your previous 5 days of lifting where you want to get the blood pumping but are too worn out to do intervals. I’m talking about the people whose workouts revolve around them walking. Ladies, I hate to call you out, but this is mostly directed at you. If you are a male and do this, just head over to the dumbbell rack and lift something. 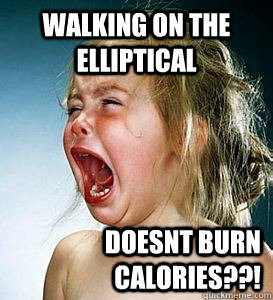 It seems to be even more of an issue on the beloved elliptical. Believe it or not, those things will not break if you get up to the speed of a jog. I’m not sure why it bothers me other than it’s a waste of time and the people doing it usually don’t have the ideal BMI (nicest way I could say they are chubby). You could spend 1/5 of the time in the gym doing either intervals or move at a pace where you actually break a sweat and accomplish the same caloric expenditure. You resting metabolic rate would also be raised for much longer after your workout was completed. This issue also carries over to people that hold on to the handles while they walk at an incline. You are basically letting the treadmill drag your legs while you hold on for the ride. Don’t jack the incline and speed up so high that you can’t walk like you would on normal ground. You are only lying to yourself by actually thinking you burned as many calories as the treadmill said you did. Instead, push yourself to do a real workout. There is nothing wrong with basing your workout around cardio as long as it is challenging. Somewhere along the line, a terrible myth was born that cardio was the key for fat loss (when I say fat loss I also mean weight loss). Running miles every day and spending 40 minutes on the elliptical at a pace that wouldn’t even be considered a jog are the answer to cutting into those fat reserves you’ve built up over the years. Unfortunately, that isn’t true at all. I have explained why HIIT training is an effective fat loss method. Many of the same principles and ideas carry over when using weight training as a method for fat loss. For starters, lifting weights increases your resting metabolic rate. Muscle has a higher energy cost than fat so as you add lean body mass, your body has to constantly work at a higher level. This results in burning more calories throughout the day while just sitting around. Another bonus of weight training is the hormonal response involved. Testosterone levels are increased along with insulin. This leads to more efficient break down of protein and carbs. It also helps with the mobilization and metabolism of fatty acids. Your body actually learns to be more effective with breaking down and moving fat to use as a fuel source. Jogging is easy. You don’t have to push yourself when you are jogging at a nice easy pace. The general public doesn’t know what to do in the weight room or how to properly do it. You see people wondering from machine to machine using a weight they could complete 35 reps with but are surprised they aren’t seeing any results. Skinny fat people jog. No one wants to be skinny fat. 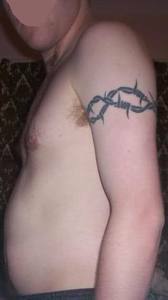 Or have a barbwire bicep tat. Challenge yourself. The weight should be heavy enough to where the last rep is difficult to complete whether you are doing a set of 3 or 15… and stay below 15. Full body workouts, 3 days a week. 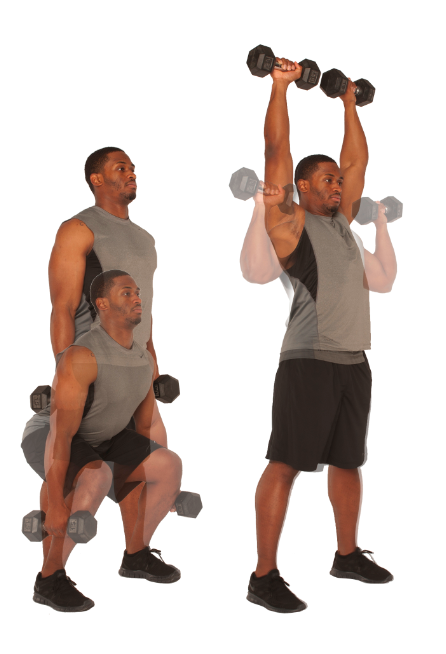 Multi-joint lifts (squat) burn more fat than isolation lifts (think bicep curls). Drop the upper and lower body splits and go with full body days so you can incorporate exercises like a DB Squat to Overhead Press. Superset. Stop standing around and socializing in between sets and add a superset. Start with pairing a more intense exercise, like to DB Squat to Overhead Press, with an isolation lift, like a bicep curl. This will allow you to do twice as much work in the same amount of time. Take 15-30 seconds of rest between the two. As you progress, make the exercise pairing more difficult or add a short sprint on the treadmill. Circuits. Once you get a hang of supersets, start doing circuits. Circuits have the same idea of a superset, just more exercises. Put together 3+ exercises and complete them in succession with short breaks in between each exercise. Once you finish one round, take a 1-2 minute break and go again. Disclaimer: Circuits are hard, really hard. If they aren’t hard, you are doing something wrong. I personally hate doing circuits because of this reason, but if you want to cut some fat, it’s the way to go. Below is a sample circuit. Complete 1 set of each exercise then move on to the next after a 15 second break. Take a 90 second break after each time through all 5 exercises. Complete the whole circuit 3 times. Start with 10 reps at a low weight and increase reps first, then weight as it gets easier. The possibilities are endless with circuits. A general rule of thumb is to make the first two exercises a multi-joint upper and lower body lift and work more towards an isolation exercise. I also like to throw in some type of cardio to really elevate the heart rate. Try it out and let me know how it goes. If you have any other suggestions for circuits or personal favorites, please feel free to share! I’m excited to announce that I have started to write for STACK. For those of you that aren’t familiar with STACK, it is a website and magazine that offer great videos and articles on workout and health information. They do a great job of showing you what the professionals are doing and providing workouts and exercises that are specific to each sport. You can check out there website HERE and their Youtube page HERE. My first article is on offseason core training and can be found HERE. I am very grateful for this opportunity and looking forward to a successful partnership. I’m not a fan of New Year’s resolutions. For one, you set yourself up for failure. If there is something you want to change in your life and you aren’t willing to change it immediately, are you really going to do it just because it’s a new year? Doubtful. Secondly, the resolutions almost always include something along the lines of exercising, eating healthier, or just improving overall health. It bothers me when people don’t place a premium on their health. Shocker, I know. How do you define exercising or eating healthier? Walking 5 minutes a day and not dipping your fries in the leftover grease from your burger? I hope you haven’t broken that one yet. The idea of resolutions is great. The carrying out of the resolutions is the problem. We fail within the first 10 days of the year and throw it out the window because we just don’t quite have it this year. But next year is definitely the year….. So what should you do instead of making resolutions? Lucky for you I have the solutions to your resolutions. See what I did there? As I pointed out earlier, saying you want to exercise every day doesn’t mean anything. Be detailed with your goals. Also, don’t set goals you know you have no chance of completing. I’m not saying don’t push yourself, but be realistic. If you never workout, are you really going to start working out for 2 hours a day, 7 days a week? Probably not. Maybe eventually you would love to be able to work out for 2 hours every day, but start with a smaller goal. By completing the smaller goals, you give yourself a sense of accomplishment and a way to track your progression. Setting the same cliche goals as everyone else is basically setting the goal of being boring and average. Set a goal for yourself that will separate you from the norm. Setting the same or similar goals as a friend will give you accountability and the extra push you may need to stick to it. My workouts are always significantly better when I go to the gym with someone else. We are able to push each other and provide a spot for each other when needed. The same principles translate over into life. Don’t let one slip up ruin the goal. For instance, nutrition expert Dr. John Berardi has a 90% rule. He believes that it is important to stick to healthy eating habits 9 out of every 10 meals. The 10th can be a cheat meal. Ideally you aim for 100%, but a mistake here or there isn’t the end of the world. I think this rule could be applied to almost any area of life you are trying to change. Hopefully this gave you some ideas that will make 2013 different for you. Start knocking out your goals immediately and don’t let anything stand in your way.